Steven Gerrard has been one of the best players to have ever played in the Premier League, it is still unfortunate that he has yet to win it, but time hasn’t run out yet. Gerrard is getting more experienced and is a player a team who build their team around. He was pivotal in Liverpool’s Champions League success back in 2005. Steven Gerrard has great drive, and his long and short range passing is admirable. He creates so many goals for his team mates and often pops up with a few screamers himself. Gerrard is club captain for Liverpool and the icon of his club at the moment. 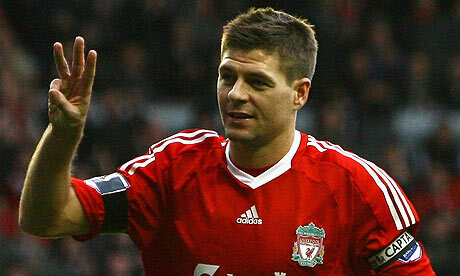 Steven Gerrard has been at Liverpool his entire career, and regarded as one of their all time greats. He scored in the final against AC Milan, where Liverpool were 3-0 down at half time before coming back to 3-3 (Gerrard with the first goal) before Liverpool won on penalties which saw Gerrard lift up the Champions League trophy. Gerrard was also pivotal in the FA Cup win just one year later, as he scored the greatest FA Cup final goal of all time in the 90th minute which saw Liverpool draw 3-3 against West Ham, and once again Liverpool won the match on penalties. Liverpool have not won the Premier League whilst Gerrard has been there, but he was fantastic in the 2008/2009 season, where they fell short of 4 points to Manchester United. Gerrard has more passion than most players, and wears his heart on his sleeve for Liverpool. He is also passionate about England, and has captained them on a few occasions. Gerrard has a portfolio of fantastic long range drives, and no other player in Premier League history can say they have scored as many screamers as Gerrard. Gerrard still has a few more years in his footballing career, but there is one thing he would love to do before retiring, and that’s win the Premier League title. Liverpool have been close in the past, but often have drifted away when it matters, but this Liverpool side with Daglish as manager is improving and are in the frame to win the title. Manchester United have now broken Liverpool’s record, and Gerrard and Liverpool will be hungry than ever to win the title back. Because of his passion, Gerrard will probably ending up coaching after his playing days, and may return to Liverpool as manager, which would sum up his passion for Liverpool and football in general, he is the adequate professional.